Social media, in general, has a ton of conversion power and no matter where we go on social media, it seems like everyone is selling something. But are these people actually making any sales or is it just an attempt without any success? Fortunately for you, if you’re looking to get sales through social media, you have the stats to rely on. A study made by Locowise found that 75 percent of Instagram users take action, such as visiting a website, after looking at an Instagram advertising post. When talking only about Instagram, it’s often seen as a bit more trickier for sales, even though it is one of the brands’ favorite platform for marketing. The main reason to this is the following: To avoid spam, Instagram decided that it wouldn’t be possible to share clickable links in your captions, comments or in Direct Messages. Only in your profile bio. Posting a link will only result in text that is not clickable. Of course, this does not mean that generating sales from Instagram isn’t possible, and not necessarily more difficult than other platforms. It only means that you need to have a slightly different approach on how you’re going to market your brand and ultimately get your followers to buy from you. Because as statistics show, it can generate tremendous results, even to the point where some brands are generating most of their sales through the platform. If you’re worried that you won’t be able to get your followers to buy from you because your following isn’t in the big leagues yet – don’t be. While big numbers certainly help in sales because you impact more people, it’s the conversion power you have that will be the determining factor whether you make any sales or not. One of the best ways to generate sales through Instagram is to engage with your audience, and doing so privately, one on one. By doing so, you’re making the conversation private and show that you value each and every one in your audience, instead of seeing them as a number or a collective of people. Thankfully, as of November 2016, sending private messages was made possible. Before the rise of Direct Messages, the only way you could engage with your audience was to chat with them in the comment sections in your or their Instagram posts. As you can imagine, those mentioned places had (and have) very little privacy as everyone could see your conversations. 1. Send coupon codes. Coupon codes are always great because they can be the “tipping point” to getting a potential customer who have thought about buying your product to actually performing the action and doing so. Thanks a lot for your like. We truly appreciate your support in our brand! To show our gratitude, we would like to offer you a coupon code at our store. Use code “Whateveryouwanttowrite” to get X% OFF on your purchase. Thank you so much for your kind words, it really means a lot. We are very happy that you enjoy our content and products. As a thank you, we’d like to offer you a discount code at our store, as a way of giving back to the community. It means a lot that you like our page and brand to the point where you want to follow our journey. We are honored to have you onboard! To thank you, we want to offer you a discount code at our store. Have a look and see if you find anything you like! These were of course just some examples of how a message of this nature can look like, but hopefully, you can use them as starting points, and then add a personal touch. 2. Announce that everyone who reposts your picture gets a discount code. Doing this has two benefits: Firstly, you get free exposure and marketing, secondly, you increase the chances that potential customers will shop from your store. In addition, the followers of those reposting your photo might see the photo, become interested in your products and then repost the image themselves in order to get a discount code. If you have a large following, this method can result in a huge chain reaction, resulting in tons of re-posts and thereby lots of exposure (and most likely also more sales). 3. Target interested customers & offer them coupons. When it comes to coupons, people who are thinking about buying your product but haven’t made up their mind yet are the best to target. Depending on how engaged your audience are, you might be able to find these people in the comment sections of your posts. 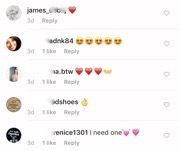 As you can see, all of these comments are comments that express an interest in the product that was displayed in the image. All that is needed to make them customers might be a message from the brand, offering them a discount. Because Instagram doesn’t offer you the ability to add clickable links in your posts, marketing single products are difficult on Instagram. In addition, changing the link in your bio after every new product post you share isn’t a very good idea. Furthermore, if you’re adding a link to your website in your bio which takes the visitors to your home page, it can confuse the visitors because they aren’t instantly presented with the product they’re looking for. If you’re familiar with any type of ads that has the objective of driving people to your website and ultimately making them shop from your store (which is the end goal), you probably know that using a landing page that is adapted to a particular product you’re showcasing, which takes the visitor directly to the product they found interesting, generates a much higher ROI and conversion rate. There is, however, a way to get around the fact that you can’t add links in your posts. This method links your followers directly to the product you’re showcasing, which is great because it doesn’t confuse the visitor, forcing them to actively search for it. That method is using tools that make your Instagram feed shoppable. What these services offer is a personal link that you add in your Instagram bio. This link takes your followers to a website which looks like your Instagram feed but the only difference is that you can add a “tag” on the products you have featured in your posts, linking them directly to the product they’re actually interested in, instead of taking them to your website’s homepage. Snappt helps bridge the gap between your Instagram and website, making for a more seamless shopping experience for your audience. Snappt also provides analytics so you can see how well your profile is performing. 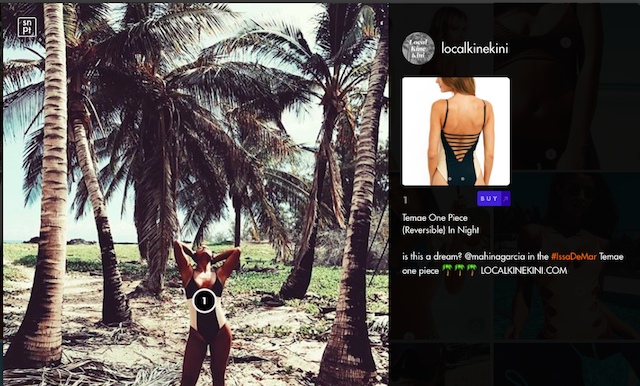 The great thing with shoppable Instagram feeds is that even though the visitor gets directed to another page, it will still feel familiar and they will have an easy time finding the post where they saw the product they were interested in. When the visitor has found the post where they saw the product, they simply tap on that image to find the product. Here, they get presented with the product and a link to shop it. By clicking the “Buy” button, they get redirected to that exact product on your website, creating no confusion in where to find it. 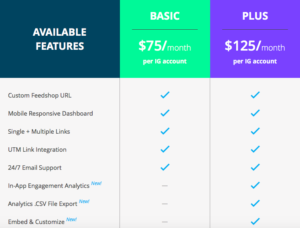 Feedshop offers a 30-day free trial. After that, they offer 2 different pricing plans. One basic and one plus. These can be chosen yearly or monthly. Just like Snappt, feedshop recreates your Instagram feed and makes it shoppable, then give you a link that you can add in your Instagram bio, redirecting your followers to a shoppable feed where they can get instantly redirected to the product they are searching for, instead of having to search for it on your website. There is no secret that influencer marketing is extremely effective. And even though I talk about influencer marketing a lot in my articles, I can’t leave it out in this one either – simply because it is too good to be ignored. 74 percent of consumers use social media to make purchase decisions. What if you can use influencers to affect consumers purchase decisions? Fortunately, you can! Brands have far from the authority and convincing power influencers have, simply because consumers aren’t looking up to brands the same way they look up to influencer. In fact, 92 percent of people trust recommendations from individuals (even if they don’t know them) over brands. That’s also why influencer marketing for brands isn’t any longer an option, it’s a necessity for successful social media marketing. Now that we’re on the Instagram track, you’ll be happy to hear that Instagram is the second most popular social media platform after Facebook. While I’m sure you’ve gotten motivated enough to go hop on Influencer marketing right away, there are some things you should know first. The more you have thought about these, the higher ROI you’ll be able to generate. 1. Which influencer will you use? Who you work with will have the biggest impact on how your campaign performs. Make sure your influencer’s niche aligns with your and that the influencer speaks the same language as your brand. If the influencer does, there’s a bigger chance that they have been able to build an audience that will like your brand as well. 2. How is the engagement of the influencer? Too many brands are blindly looking at follower count when choosing influencer. There are so many more factors that you should take into consideration, and engagement is one of them. What is the like/follower rate? What comments do they receive? Are they genuine comments from someone who actually looks up to them or are the comments general friendly words such as “nice” and awesome”? If so, the influencer might leave a big impact on their followers. 3. What kind of content do they share? You need to decide if the influencer is going to create the content or if they’re just going to post a pic of your on their page. 4. Do you prefer several micro-influencers or one large influencer? The popularity of micro-influencers is increasing dramatically. That’s because even though micro-influencers don’t have a large following, it is often very targeted and has a higher engagement rate than larger influencers. In addition, micro-influencers are much cheaper and often satisfy with products instead of cold hard cash. Brands identify finding suitable influencers as the biggest challenge of influencer marketing. There are so many factors to consider and think about. That’s why I recommend Veloce Network Influencer directory. The directory has gathered thousands of the leading social media influencers in order to simplify your influencer marketing – solving the biggest pain points of marketers when it comes to influencer marketing. Fill in your criteria and then click search. You’ll now be presented with the most relevant influencers based on the criteria you chose, so you can run an influencer marketing campaign that is laser-targeted towards your audience. When you have found your influencer, you want to do a bit more research in order to learn exactly what you can expect from the campaign. A great tool to use for this is SimplyMeasured. Another tool you can use is Locowise. Locowise lets you check the statistics of your own page and also compare it to another account, which in this case should be the influencer’s. When your followers feel like they’re involved in the creation of your followers, there is a bigger chance they will buy your products because they were part of the end result. For example, make a post and ask your followers which colors you should make your products, which new products you should add etc. Engaging with your audience is key on social media and this is a great way to include them in your work in a fun and unique way, while also increasing the chances of getting them purchase from you. There are other ways you can include your audience and have increased sales as a result. Arrange a raffle/contest/giveaway on your Instagram BUT only make it possible for already existing customers to join. In order for this to work effectively, you need to have a great prize for the winner. For example, if you are selling t-shirts for $20, and then arrange a contest where the winner gets a car for $20,000, who wouldn’t buy a shirt for 1 thousandth of the price the car costs for a chance to win it? As you can imagine, the better the prize is, the more entries you will have, and therefore also more people buying from you to join the contest.